Let’s imagine you are sitting in an aircraft on the runway that is ready to go. The engines start rumbling, the aircraft is accelerating and you’re pressed into your seat. Now the question is, in which flight phase is the most thrust available? – or if the engines are running at high power during takeoff? 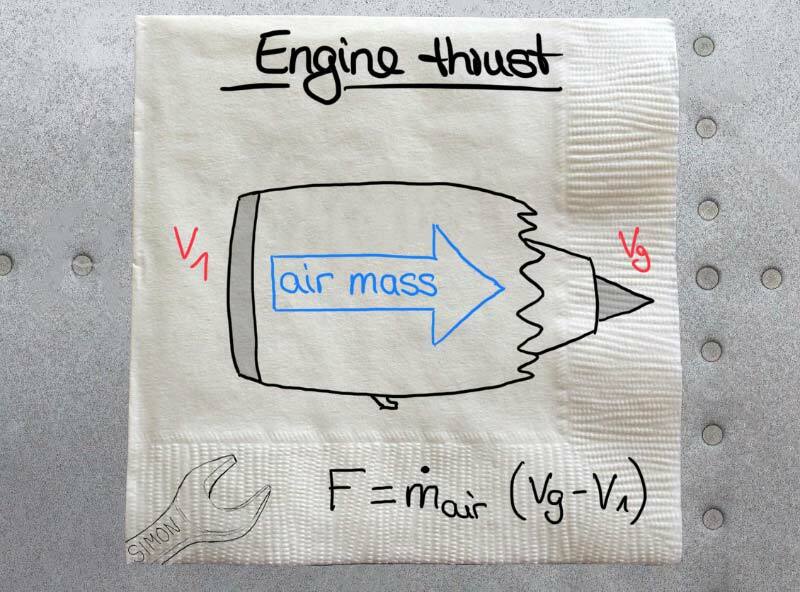 We have to go into physics, to explain and calculate when the most thrust is available. Please note, all figures are just fictional to keep the calculation as simple as possible. Let’s imagine the aircraft is flying with 388 knots and the velocity of the air going into the engine is equal to the aircraft’s airspeed. The total airmass going through the engine is 100 kg/s and the velocity of the air in the exhaust is 400m/s. The aircraft is on the runway the brakes are set and the engines are delivering takeoff power. As mentioned before V1 is the airspeed and if the airspeed is zero, because the aircraft is standing still, figure V1 = zero. Let’s use the same figures to keep the calculation as simple as possible. As an additional note, the engine produces continuously thrust even if it’s running at idle power. The reason is the velocity of the exhausting air is always higher than the air entering the engine. This is due to the shape of the nozzle. To draw a conclusion, the slower the aircraft the higher the thrust of the engine with the same air mass going through the engine. For all professionals here, the formula changes a bit for calculating a turbofan engine with bypass, due to the different exhausting airspeeds (between core and bypass), but I wanted to keep the explanation as simple as possible.